MOKOPANE, SOUTH AFRICA – Ivanhoe Mines’ (TSX: IVN; OTCQX: IVPAF) Executive Chairman Robert Friedland, Chief Executive Officer Lars-Eric Johansson and Ivanplats’ Managing Director Dr. Patricia Makhesha announced today that Shaft 1 has reached a depth of 500 metres below surface, more than half way to the planned final depth of 980 metres, at the company’s Platreef platinum, palladium, rhodium, gold, nickel and copper mine. The 7.25-metre-diameter Shaft 1, which is expected to reach the Flatreef mineralization at a depth of approximately 783 metres in the third quarter of next year, will be used for initial access to the Flatreef Deposit and early underground development. The first shaft station, completed in September at a depth of 450 metres, will be used as an intermediate location for water pumping and shaft-cable termination. 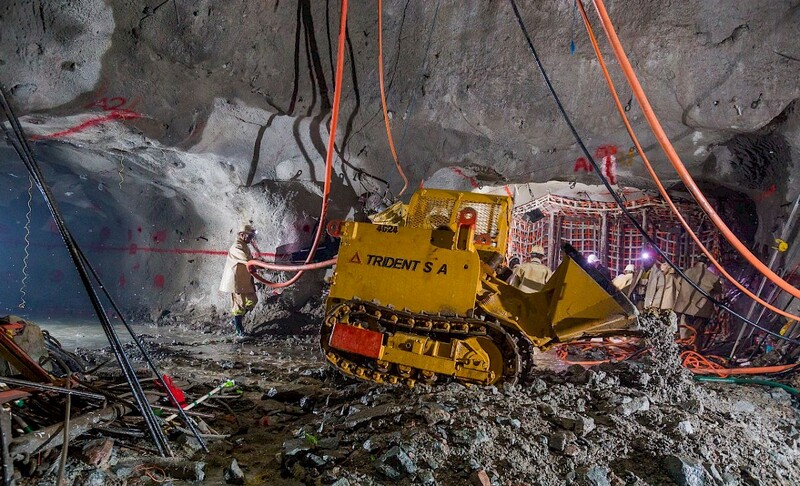 As shaft sinking advances, an additional three shaft stations will be developed at mine working depths of 750 metres, 850 metres and 950 metres. The sinking of Shaft 1 is continuing to advance at a rate of 40 to 50 metres per month. Approximately 40% of Platreef’s shaft-sinking team now is comprised of employees from local communities who had no previous mining experience. New employees received intensive, on-site training for underground-mining and completed a workplace-safety induction program. “We pride ourselves on having a highly-skilled, safety-focused workforce, and we have been impressed by the willingness of our senior staff to help pass on these skills to the next generation of miners,” said Dr. Makhesha. Platreef’s Shaft 1 sinking headgear and related surface infrastructure. Shaft-sinking crew during development of the 450-metre station. Early-works surface construction for Shaft 2 began last May with initial curtain grouting around the box cut. Further work includes the excavation of a surface box cut to a depth of approximately 29 metres and construction of the concrete hitch for the 103-metre-tall concrete headgear (headframe) that will house the shaft’s permanent hoisting facilities and support the shaft collar. The early-works construction is expected to be completed in the third quarter of next year. Shaft 2 will have an internal diameter of 10 metres and the capacity to hoist six million tonnes per year. The headgear design for the six-million-tonne-per-year permanent hoisting facility has been completed by South Africa-based Murray & Roberts Cementation. A geotechnical drill hole (GT008) drilled vertically below Shaft 1 indicates that the shaft will intersect the upper contact of the Flatreef Deposit (T1 mineralized zone) at an approximate shaft depth of 783 metres. The grade for the T1 mineralized zone at this location is 4.83 grams per tonne (g/t) 3PE (platinum, palladium and rhodium) plus gold, 0.33% nickel and 0.15% copper over a vertical thickness of 12 metres (see Figure 1). 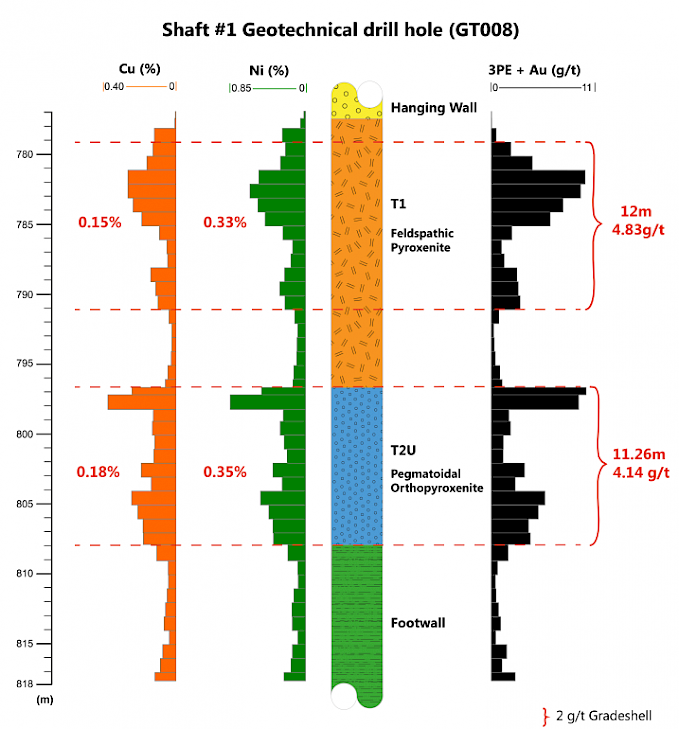 A well-developed chromitite stringer, marking the stratigraphic contact between the T1 and T2 mineralized zones, is expected to be intersected at a shaft depth of 792.1 metres. This will be followed by the T2 mineralized zone, which grades 4.14 g/t 3PE + gold, 0.35 % nickel and 0.18% copper over a vertical thickness of 11.26 metres (at a 2 g/t 3PE+gold grade cut-off). Members of Platreef’s shaft-sinking team in Shaft 1 at a depth of 500 metres. Figure 1: Downhole plot of Shaft 1 geotechnical drill hole GT008 displaying grade shells at a 2 g/t 3PE+Au cut-off grade. Note: Metres quoted in text are based on depth below shaft bank; metres in Figure 1 are quoted based on drill hole depth below surface. 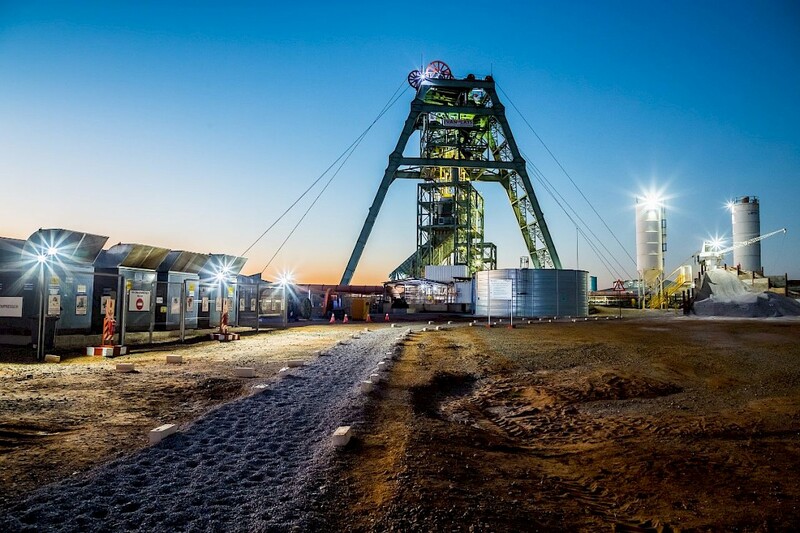 The Platreef Project, which contains the Flatreef Deposit, is a Tier One discovery by Ivanhoe Mines’ geologists on the Northern Limb of South Africa’s Bushveld Igneous Complex, the world’s premier platinum producing region. Ivanhoe plans to develop the Platreef Mine in three phases: 1) An initial rate of four million tonnes per annum (Mtpa) to establish an operating platform to support future expansions; 2) a doubling of production to eight Mtpa; and 3) expansion to a steady-state 12 Mtpa. On July 30, 2017, Ivanhoe issued an independent definitive feasibility study (DFS) for Platreef that covers the first phase of development that would include construction of a state-of-the-art underground mine, concentrator and other associated infrastructure to support initial production of concentrate by 2022. As Phase 1 is being developed and commissioned, there would be opportunities to refine the timing and scope of subsequent phases of expanded production. Mr. Johansson said the July study’s results demonstrate Platreef’s robust economics, which first were highlighted in the March 2014 preliminary economic assessment and further reinforced by the January 2015 pre-feasibility study. Mr. Johansson also noted that the project has shown significant improvement insafety and achieved a Lost Time Injury-Free (LTIF) record in the latest quarter. As of end of October 2017, the project had achieved 132 days without a lost-time-accident. Various initiatives have been implemented by Ivanplats and Aveng Mining to improve the safety culture on site. Indicated Mineral Resources totalling 346 million tonnes at a grade of 3.77 g/t 3 PE +gold, using a 2 g/t cut-off, contain an estimated 41.9 million ounces of platinum, palladium, rhodium and gold. An additional 52.8 million ounces of platinum, palladium, rhodium and gold are contained in Inferred Resources totalling 506 million tonnes at a grade of 3.24 g/t 3 PE +gold, using a 2 g/t cut-off. Enhanced Mineral Reserve totalling 124.7 million tonnes grading 4.40 g/t 3 PE +gold contain 17.6 million ounces of platinum, palladium, rhodium and gold – an increase of 13% compared to the 2015 pre-feasibility study – following stope optimization and mine sequencing work. Planned initial average annual production rate of 476,000 ounces of platinum, palladium, rhodium and gold, plus 21 million pounds of nickel and 13 million pounds of copper. Estimated pre-production capital requirement of approximately US$1.5 billion, at a ZAR:USD exchange rate of 13 to 1. 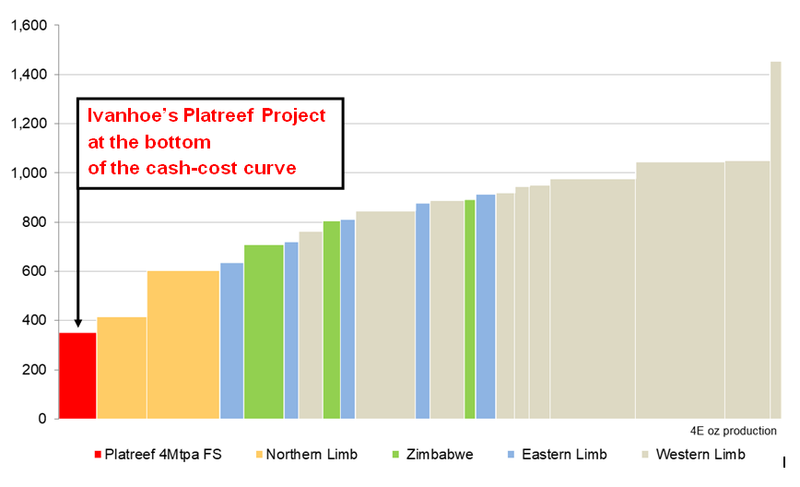 Platreef would rank at the bottom of the cash-cost curve, at an estimated US$351 per ounce of 3PE+Au produced, net of by-products and including sustaining capital costs, and US$326 per ounce before sustaining capital costs. After-tax Net Present Value (NPV) of US$916 million, at an 8% discount rate. After-tax Internal Rate of Return (IRR) of 14.2%. The actual return to project equity owners is expected to be higher as a result of the significant amount of project financing that is being raised. Figure 2: Net total cash cost + SIB capital (2017 mines in production and selected projects), US$/3PE + gold oz. Source: SFA (Oxford). Data for Platreef Project and Waterberg are based on each project’s reported DFS and PFS parameters respectively, and are not representative of SFA's view. Figure 3: Total 2017E global primary platinum-equivalent production. Source: Production estimates for projects other than Ivanhoe’s Platreef Project have been prepared by SFA (Oxford). Production data for the Platreef Project (platinum, palladium, rhodium, gold, nickel and copper) is based on reported DFS and PEA data and is not representative of SFA's view. All metals have been converted by SFA (Oxford) to platinum equivalent ounces at price assumptions of US$1,076/oz platinum, US$761/oz palladium, US$1,235/oz gold, US$821/oz rhodium, US$5.07/lb nickel and US$2.42/lb copper. 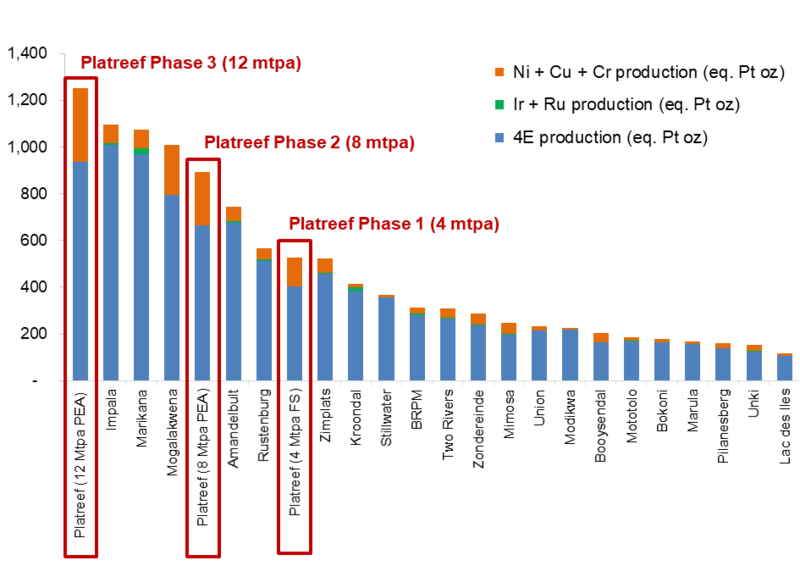 Note: As the figures are platinum-equivalent ounces of production they will not be equal to 3PE+Au production. Mining zones in the current Platreef mine plan occur at depths ranging from approximately 700 metres to 1,200 metres below surface. Primary access to the mine will be by way of a 1,104-metre-deep, 10-metre-diameter production shaft (Shaft 2). Secondary access to the mine will be via a 980-metre-deep, 7.25-metre-diameter ventilation shaft (Shaft 1). During mine production, both shafts also will serve as ventilation intakes. Three additional ventilation exhaust raises (Ventilation Raise 1, 2, and 3) are planned to achieve steady-state production. Mining will be performed using highly productive mechanized methods, including long-hole stoping and drift-and-fill. Each method will utilize cemented backfill for maximum ore extraction. The current mine plan has been improved over the 2015 PFS mine plan by optimizing stope design, employing a declining Net Smelter Return (NSR) strategy and targeting higher-grade zones early in the mine life. This strategy has increased the grade profile by 23% on a 3PE+Au basis in the first 10 years of operation and 10% over the life of the mine. The ore will be hauled from the stopes to a series of internal ore passes and fed to the bottom of Shaft 2, where it will be crushed and hoisted to surface. Given the size and potential of the Platreef Resource, as demonstrated by the phased expansions outlined in the PEA, Shaft 2 has been engineered with a crushing and hoisting capacity of six Mtpa. A further expansion to more than eight Mtpa would entail converting Shaft 1 from a ventilation shaft into a hoisting shaft. This would require additional ventilation exhaust raises, as well as a further increase of underground development, commissioning of a fourth, two-Mtpa processing module and associated surface infrastructure, as described in the PEA as Phase 2 of the project. Platreef Mine illustration of first-phase surface infrastructure and host communities. On July 19, 2017, Ivanhoe Mines announced the appointment of two leading mine-financing institutions, in addition to the three leading financial institutions appointed earlier this year, to arrange project financing for the development of the Platreef Project. The five Initial Mandated Lead Arrangers (IMLAs) will make best efforts to arrange a total debt financing of up to US$1 billion for the development of Platreef’s first-phase, four Mtpa mine. Preliminary expressions of interest now have been received for approximately US$900 million of the targeted US$1 billion financing. Negotiation of a term sheet is ongoing. In addition, preliminary discussions have commenced with leading financial institutions around the financing of the black economic empowerment partners’ contribution to the development capital. The IMLAs appointed Export Development Canada (EDC) to direct the technical, environmental and social due diligence phase of the project. Chlumsky, Armbrust & Meyer LLC (CAM) and IBIS ESG South Africa Consulting Pty Ltd (IBIS) were appointed as Independent Technical Consultant (ITC) and Independent Social and Environmental Consultant (ISEC), respectively. Site visits were conducted during July and August 2017, with initial letter reports issued to the potential lenders. The final due diligence reports are expected by the end of this year. The scientific and technical information in this news release has been reviewed and approved by Stephen Torr, P.Geo., Ivanhoe Mines’ Vice President, Project Geology and Evaluation, a Qualified Person under the terms of National Instrument (NI) 43-101. Mr. Torr is not independent of Ivanhoe Mines. Mr. Torr has verified the technical data disclosed in this news release. Detailed information about assay methods and data verification measures used to support the scientific and technical information, are set out in the Platreef 2017 Feasibility Study NI 43-101 Technical Report dated September 2017, available under Technical Reports at www.ivanhoemines.com and on Ivanhoe Mines' SEDAR profile at www.sedar.com. 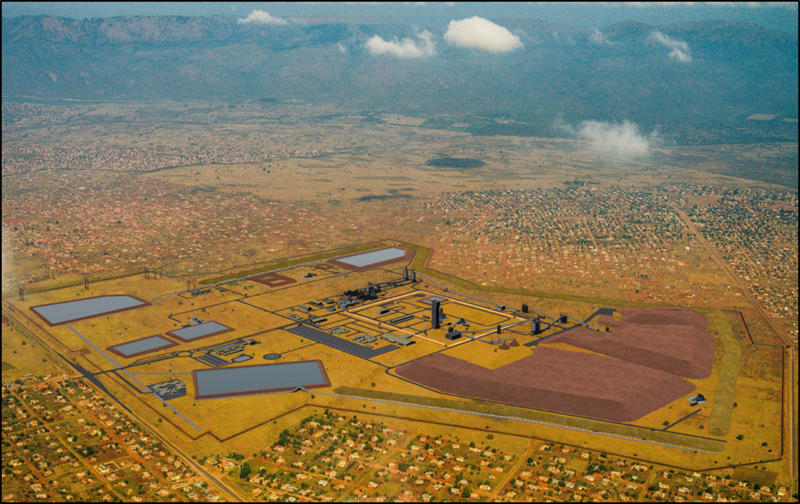 Ivanhoe Mines is advancing its three principal projects in Southern Africa: 1) Mine development at the Platreef platinum-palladium-gold-nickel-copper discovery on the Northern Limb of South Africa’s Bushveld Complex; 2) mine development and exploration at the tier one Kamoa-Kakula copper discovery on the Central African Copperbelt in the Democratic Republic of Congo (DRC); and 3) upgrading at the historic, high-grade Kipushi zinc-copper-silver-germanium mine, also on the DRC’s Copperbelt. For details, visit www.ivanhoemines.com. Certain statements in this news release constitute “forward-looking statements” or “forward-looking information” within the meaning of applicable securities laws. Such statements involve known and unknown risks, uncertainties and other factors, which may cause actual results, performance or achievements of the company, the Platreef Project, or industry results, to be materially different from any future results, performance or achievements expressed or implied by such forward-looking statements or information. Such statements can be identified by the use of words such as “may”, “would”, “could”, “will”, “intend”, “expect”, “believe”, “plan”, “anticipate”, “estimate”, “scheduled”, “forecast”, “predict” and other similar terminology, or state that certain actions, events or results “may”, “could”, “would”, “might” or “will” be taken, occur or be achieved. These statements reflect the company’s current expectations regarding future events, performance and results, and speak only as of the date of this news release. The forward-looking statements and forward-looking information in this news release include without limitation, (i) statements regarding early-works construction is expected to be completed in the third quarter of 2018; (ii) statements regarding Shaft 2 is to be sunk to a planned, final depth of 1,104 metres; (iii) statements regarding Shaft 1 is expected to reach the Flatreef mineralization at a depth of approximately 783 metres in the second quarter of 2018; (iv) statements regarding the planned mining of the Flatreef Deposit will incorporate highly productive mechanized mining methods, including long-hole stoping and drift-and-fill mining; (v) statements regarding the first phase estimated annual production of 476,000 ounces of platinum-group metals and gold; and (vi) statements regarding Ivanhoe’s plans to develop the Platreef Mine in three phases: an initial annual rate of four Mtpa to establish an operating platform to support future expansions; followed by a doubling of production to eight Mtpa; and then a third expansion phase to a steady-state 12 Mtpa. In addition, all of the results of the Platreef DFS constitute forward-looking statements and forward-looking information. The forward-looking statements include metal price assumptions, cash flow forecasts, projected capital and operating costs, metal recoveries, mine life and production rates, and the financial results of the Platreef DFS. These include statements regarding the Platreef Project IRR of 14.2% after tax, the Platreef Project’s NPV of US$916 million at an 8% discount rate after tax (as well as all other before and after taxation NPV calculations), estimated all-in cash costs (including the life-of-mine average estimate of US$351 per ounce of 3PE+Au net by-product credits), capital cost estimates (including pre-production capital of US$1,544 million), proposed mining plans and methods, a mine life estimate of 32 years, a project payback period of 5.3 years; the expected number of people to be employed at the Project; and the availability and development of water and electricity for the Platreef Project. All such forward-looking information and statements are based on certain assumptions and analyses made by Ivanhoe Mines’ management in light of their experience and perception of historical trends, current conditions and expected future developments, as well as other factors management believe are appropriate in the circumstances. These statements, however, are subject to a variety of risks and uncertainties and other factors that could cause actual events or results to differ materially from those projected in the forward-looking information or statements including, but not limited to, unexpected changes in laws, rules or regulations, or their enforcement by applicable authorities; the failure of parties to contracts to perform as agreed; social or labour unrest; changes in commodity prices; unexpected failure or inadequacy of infrastructure, industrial accidents or machinery failure (including of shaft sinking equipment), or delays in the development of infrastructure, and the failure of exploration programs or other studies to deliver anticipated results or results that would justify and support continued studies, development or operations. Other important factors that could cause actual results to differ from these forward-looking statements also include those described under the heading “Risk Factors” in the company’s most recently filed MD&A as well as in the most recent Annual Information Form filed by Ivanhoe Mines. Readers are cautioned not to place undue reliance on forward-looking information or statements. Certain of the factors and assumptions used to develop the forward-looking information and statements, and certain of the risks that could cause the actual results to differ materially are presented in the “Platreef 2017 Feasibility Study, September 2017” available on SEDAR at www.sedar.com and on the Ivanhoe Mines website at www.ivanhoemines.com. This news release also contains references to estimates of Mineral Resources and Mineral Reserves. The estimation of Mineral Resources and Mineral Reserves is inherently uncertain and involves subjective judgments about many relevant factors. Mineral Resources that are not Mineral Reserves do not have demonstrated economic viability. The accuracy of any such estimates is a function of the quantity and quality of available data, and of the assumptions made and judgments used in engineering and geological interpretation, which may prove to be unreliable and depend, to a certain extent, upon the analysis of drilling results and statistical inferences that may ultimately prove to be inaccurate. Mineral Resource or Mineral Reserve estimates may have to be re-estimated based on, among other things: (i) fluctuations in platinum, palladium, gold, rhodium, copper, nickel or other mineral prices; (ii) results of drilling; (iii) results of metallurgical testing and other studies; (iv) changes to proposed mining operations, including dilution; (v) the evaluation of mine plans subsequent to the date of any estimates; and (vi) the possible failure to receive required permits, approvals and licences.